This week, Whitecaps FC and the MLS revealed the 2019 schedule kicking off the preseason February 8, 2019 in Honolulu, HI. Home fans will get their first look at new coach Marc Dos Santos’ new look team when 34 regular season gets underway March 2nd hosting Minnesota United FC at home in BC Place. In celebration of the historic 1979 NASL Soccer Bowl triumph by the “team from the Village of Vancouver”, Whitecaps FC will host an anniversary match on August 31 against New York City FC, reminiscent of the 2-leg semi-final victory over New York Cosmos at Giants Stadium which sent the Whitecaps to the Soccer Bowl. Other highlights of the season include Cascadia Cup home fixtures against Seattle Sounders and Portland Timbers in March and May, a visit from Canadian rivals Toronto FC on May 31st. Community matches include, Jeans Day, in support of BC Children’s Hospital Foundation: Saturday, April 27 vs. Philadelphia Union. Pride Night is Saturday, May 25 vs. FC Dallas and the annual Legends & Stars Charity Match takes place Saturday, September 14 vs. Houston Dynamo. The season on Decision Day, as all league matches kick off at 1 p.m. PT. The ‘Caps host Western Conference rival Real Salt Lake at BC Place in the regular season finale. The new fixed-bracket, single-elimination format for the Audi 2019 MLS Cup Playoffs begins on October 19 with the 2019 MLS Cup is set for November 10. The BC Sports Hall of Fame recently revealed its 2019 Induction Class. The 2019 Induction Class features five athletes, three builder-coaches, one team, one pioneer, one media member and one W.A.C. Bennett award winner. The 53rd Induction Class will be honoured at the 2019 Induction Gala, presented by Victory Square, Thursday, May 23rd, 2019 at the Vancouver Convention Centre. Visit the BC Sports Hall of Fame online at bcsportshalloffame.com. This weekend, Luke Bryan‘s What Makes You Country Tour made a stop at BC Place Stadium in Vancouver. The country superstar packed the tour with 4 other support acts, making it like a six hour country festival. The dinner hour audience was warmed up by Carly Pearce, then Jon Pardi took the stage. In between sets, DJ Rock kept audiences energized and dancing. Once Sam Hunt took the stage, the audience was filling the seats and the energy was filling BC Place to the roof. The Georgia-born singer-songwriter was welcomed to the stage with a roar, in all-black outfit and ballcap, his swagger gave a hip-hop/pop vibe. Hunt led a singalong as he played his hits “Downtown’s Dead”, “Take Your Time”, “Body Like A Backroad”, “House Party”, and a mid-set Honky Tonk tribute to those country star he grew up listening to; Brooks & Dunn, The Dixie Chicks, Tim McGraw, Garth Brooks. His easy country/rock style has crossover appeal and he worked the audience to make sure everyone was on the Sam Hunt bandwagon. The stadium was packed and roaring as headliner Luke Bryan took the stage with “Country Girl (Shake is for me)” which definitely prompted a lot of Vancouver girls, and guys, to shake it for him. The affable platinum-selling country superstar worked the whole stage reaching as many of the audience he could. While it was noticeable that something was troubling Luke, and he mentioned suffering from local allergies, his vocals didn’t seem troubled at all. His charm and energy shone throughout the set, high-energy tracks balanced with sweet acoustic ballads. After a rousing cover of Alabama’s “Mountain Music”, Bryan slowed it down with the audience favourite “Drink A Beer”. “Play It Again” and appropriate for Vancouver “Rain Is A Good Thing” closed out the main set. Even for those of us who didn’t attend the whole 6 hours of performances, Sam Hunt and Luke Bryan alone definitely left the audience satisfied. The What Make You Country Tour has just two more dates, wrapping up nearly a year’s worth of shows, in Rochester and Detroit. Beer: Raise your mug, grab your schnitzel and hit the dancefloor at #DasOriginal Oktoberfest at Vancouver Alpen Club this Friday and Saturday night. Movies: The Vancouver International Film Festival (VIFF) continues to fill cinemas around the city until October 12th. Fright: Experience the thrills and chills of the haunted houses, rides and ghouls of Fright Nights at Playland throughout the month. Test: At The Cultch York Theatre until October 13th, Testosterone is the true story of trans man Kit Redstone’s first entrance into a male gym changing room. Diwali: A Vancouver Guldasta peaks inside the home of the Dhaliwals —a Punjabi family in Vancouver as they deal with events at home and abroad in Punjab, in the early 1980s. Presented with Diwali in BC at The Cultch Culture Lab until October 21th. PlayDome is back for 2018 under the roof at BC Place for six days of carnival rides, games and fun. Western Canada’s largest indoor carnival features over 45 rides and attractions all inside BC Place in downtown Vancouver. PlayDome opens tomorrow Wednesday, March 28th continuing until Monday, April 2nd fair-lovers can step out of the rain and enjoy all their favourite rides inside and dry under the Dome. After taking a spin on a ride, take another on one of the carnival games or treat yourself to some time-tested carnival fare like cotton candy, mini donuts, slushies and more! PlayDome is fun for all ages, not just the kids. But families will find plenty of Spring Break fun, children under 2 are free and Spectator Guest Passes are available for adults to accompany children on a limited number of rides. Purchase tickets online to save on Dome Passes, Ultimate Passes and Guest Passes. The 2018 edition of HSBC Canada Sevens Vancouver wrapped up with a record attendance of 77,096 coming through the gates at BC Place this weekend. If you haven’t attended Canada Sevens or any other stop on the Sevens Series, it’s hard to imagine just how much fun the fans have at the stadium. Fancy Dress, costumed groups of supporters fill the stadium (and the city) from 8:30am until after 7pm for two days to watch two days of quick, high scoring, action-packed matches of Rugby Sevens. With sixteen teams from around the globe competing, it feels like the world comes to BC Place for the tournament, even Marvel hero Thor got into the spirit and dressed up as Chris Hemsworth when he stopped by the stadium on Sunday. After 45 exciting matches over the two days, Fiji came away with their second win of then 2018 HSBC Seven Series. The crowd packed in all 39,000 seats on a sold out Saturday, not an empty seat was had for the home team’s debut against Australia. A thrilling match that Canada pull even with Oz on the final play. A hard fought match against the USA ended in a loss on a last minute turn over before wrapping up the day on a convincing 47-5 win over Uruguay. Combined with an Australian win over USA on Day 1’s final match meant Canada finished 3rd in Pool A and wouldn’t advance to play for the Cup on Day 2. A sunny Sunday brought more fancy dress wearing crowds and more action-packed matches. A Canadian loss to Scotland early on Day 2 meant the home team wouldn’t challenge for the Challenger Trophy and at the end of the day one more win and loss meant 14th place for Canada. The audience was far from disappointed with Canada’s good play over all their matches but Rugby Sevens moves so quickly one play can change the outcome in a snap. The final set up to between Kenya and Fiji, both teams with large contingents of cheering fans. Team Fiji has so many supporters in BC Place that it felt like a home match for them. 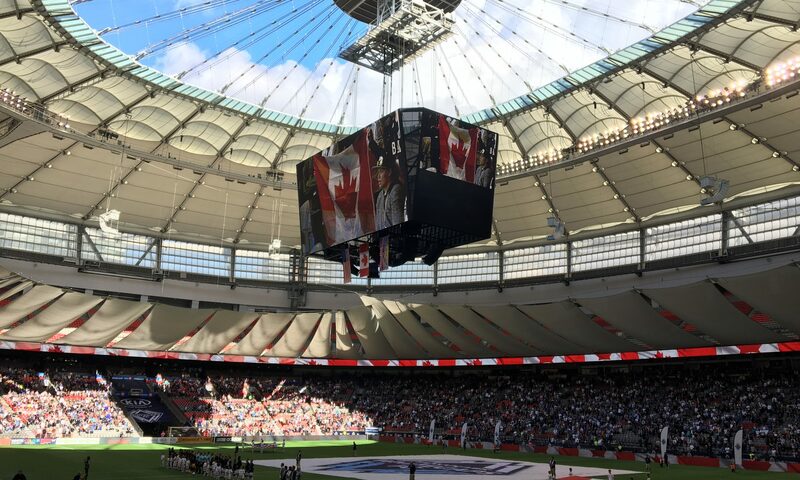 The 2019 Canada Sevens men’s tournament is set for next spring but this year Vancouver is bidding to bring 4 more years of Canada Sevens to the city from 2020 – 2023. If you missed out this year make sure to get your tickets for next year’s HSBC Canada Sevens Vancouver. For more great Sevens action, catch Canada’s Olympic Bronze medal winning Women’s team at HSBC Canada Women’s Sevens at Westhills Stadium in Langford (Greater Victoria) May 12-13, 2018 and catch the 2018 Rugby World Cup Sevens in San Francisco July 20-22, 2018.